Following on from the previous blog which looked at how even the smallest consumption of alcohol is not safe, in terms of its ability to increase your risk of certain cancers, this blog looks at how the methods used in processing and preserving your food can also ramp up the nasty possibility that one day your doc will mention the ‘C’ word. The Continuous Update Project (CUP), which analyses research on what causes cancer and how it can be prevented, operates under the auspices of the WCRF/AICR (World Cancer Research Fund/American Institute for Cancer Research). The following information is taken from their Third Expert Report 1 released in 2018. This information can be seen in the following chart. The processing and preserving methods affect the chemical composition of foods as well as their nutritional value and carcinogenic potential. 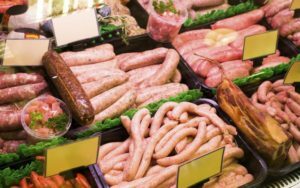 “meats (usually red meats) that have been preserved by salting, curing, fermentation, smoking, or other processes to enhance flavour or improve preservation. Around the world, raw fish is widely preserved by salting and, depending on the precise conditions, salt-preserved fish may also undergo fermentation. 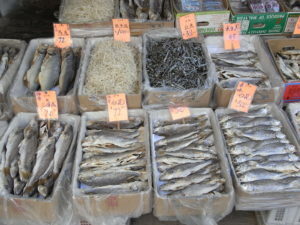 Cantonese-style salted fish uses less salt and a higher degree of fermentation than other methods of fish preservation. Some diets around the world still include significant quantities of salt-preserved foods, including salted meat, fish, vegetables and sometimes even fruit. The World Health Organisation (WHO) recommends a daily maximum salt consumption of less than 5 grams (equal to less than 2 grams of sodium). 3 The Report advises that nobody should consume Cantonese-style salted fish. Additionally, they say it’s best not to consume any foods that have been preserved by salting. 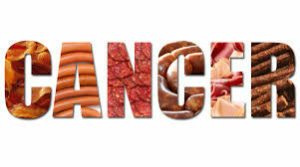 processed meat is also a source of exogenously derived N-nitroso compounds 10 11 , which may have carcinogenic potential. Cantonese-style salted fish contains nitrosamines and nitrosamine precursors 12 . Some samples of Cantonese-style salted fish have been shown to have high levels of a nitrosamine called N-nitrosodimethylamine 13 and, in experimental models with animals, this has been found to found to induce cancer development. There’s more information available 19 on the process by which cancer develops. You may also be interested in a blog I wrote about the fascinating subject, intimately related to cancer development, of angiogenesis and the work of Dr William Li 20 . What stands out to me on the above chart is that there is nothing entered in the green column (i.e. evidence that these foods in any way decrease the risk of cancer. Isn’t this enough for any sensible person to conclude that such processed and salt-preserved foods should simply be removed from their diet – completely? Of course, we’re not all sensible people and even the sensible ones amongst us are not sensible all the time. Of course sausage and bacon, salty and smoked fish taste wonderful and are so tempting – but I understand that injecting heroin is a wonderful (though transient) experience. Rushing out to buy some syringes? 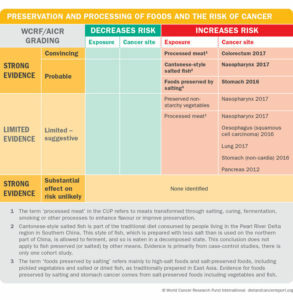 In the next blog we’ll take a quick look at the WCRF/AICR findings on how meat, fish and dairy consumption affects the risk of developing cancer.